Thanks to our partners and supporters, the Michael R. Carper Hope & Opportunity Fund has saved 40 households at-risk of eviction from losing their homes. Shari is in her mid 50’s. She is soft spoken and a careful listener. Careful listening is a habit she picked up after suffering a stroke that left her nearly deaf in one ear. Hearing loss isn’t her only challenge. That stroke put Shari in a coma for a period of time and now she lives daily with disabilities as a result. Shari has very limited income—a little more than $700 a month to cover rent, food, and prescriptions. Not much left over after the bills for life’s little pleasures. Despite the hardships, Shari is positive, grateful and full of smiles especially when you ask her about her home. Shari lives in an efficiency unit at Skyline View Apartments in Reading, Pa. Before moving to Skyline View, Shari bounced from place to place with her mother. They even lived in a homeless shelter briefly. Last year, Shari thought she might be headed back to the shelter after she found herself in crisis. She was facing eviction and homelessness again, after her mother, who was also her roommate, moved out. Shari didn’t want to move again. “I have friends here. I have a community,” she said. But with no resources to fall back on, Shari was unsure what to do. She didn’t have enough income to cover the rent without her mother’s share. She turned to the community and tried to find help, but time and again was told there were no resources available to help her. As a last resort, Shari reached out to HDC MidAtlantic’s Resident Services. Resident Services works to strengthen the mental, physical, financial and emotional health of our residents and communities. In Shari’s case, the Resident Service Coordinator worked with the Community Manager at Skyline View Apartments to come up with a plan. First, they knew Shari wouldn’t be able to stay in her current apartment. She simply didn’t have the income to afford it long-term. So the community manager helped Shari relocate into an available efficiency apartment at Skyline that fit within her means. Next, the Resident Service Coordinator helped Shari with budgeting and got her on a payment plan. 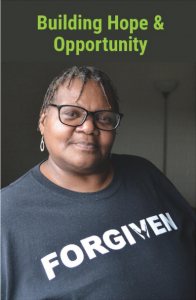 Lastly, they helped Shari apply for help from the Carper Hope & Opportunity Fund to relieve her of the outstanding rent she was responsible for after her mother moved. Shari owed roughly $500—nearly 70% of her monthly income and the difference between having a roof over her head and homelessness. First and foremost, the Carper Hope & Opportunity Fund was created to prevent evictions and homelessness. This past year, Resident Services connected 311 households with eviction-prevention services. The average amount of support needed to help a resident keep their home was only $660. Your contribution, no matter the size, will make a real difference in someone’s life. Thank you for your generosity and support.